This is a 2009 French white wine. 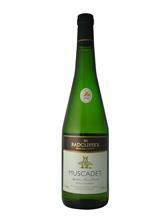 It is a very aromatic, dry white wine with a delicious crisp taste and hints of an appley flavour. It has an 11.5% volume. I served it chilled with a nice lemon chicken and cous cous meal and it accompanied the meal very well. It was very easy to drink and I enjoyed every sip of it. I love a nice cold glass of white wine to wind down and relax at the end of the day, and this wine did not disappoint. It was very rich in flavour and taste. I'm trying to describe it as it was for me, as I am not a wine expert, so I cannot describe it in a connoisseur kind of way. "Muscadet is a classic French white wine, made from Melon de Bourgogne grapes grown in the maritime climate of the western Loire Valley, in the region irrigated by the Sèvre and Maine rivers. This wine is pale yellow-green in colour, with attractive citrus and floral aromas and delicate flavours. A crisp, refreshing wine that is traditionally served with fish and shellfish, or on its own as an aperitif." This is a 2008 medium-bodied Italian red wine. It has a deep ruby red colour and has scents of berries and vanilla. It has a 12.5% volume. I am not a very big fan of red wine - I'm more of a white wine person, whereas my husband is more of a red wine person, but we have both red and white to please us both. This was a very nice wine however - it has a very depthful taste to it and is a pleasure to the tastebuds. I had this wine as an accompaniment to a roast chicken and mediterranean vegatables meal and it made the perfect match to the meal. I didn't much like the after-taste, though that may be because I simply am not a big fan of red wine - my husband thought it was very enjoyable on the other hand, but then he does like red wine best. "A classic Tuscan red wine, made predominantly from Sangiovese grapes and characterised by a deep ruby red colour with shades of violet. This typical example has pleasant aromas of red berry fruits and vanilla, and a remarkable body with good balance and a long finish. It is the perfect accompaniment to both red and white roast meats, or Italian cured meats." The complete Radcliffe’s Collection includes Muscadet, Prosecco, Pinot Grigio, Pinot Grigio Blush, Rioja, Côtes du Rhône, Corbières, Chianti, Chablis, Sancerre, Barolo and Châteauneuf du Pape. Available from www.radcliffeswines.co.uk, branches of Martin McColls, Wine Rack, Bargain Booze, Wine Shak and independent wine merchants nationwide. Prices start at £5.49.